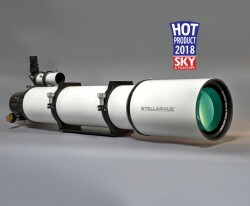 This is Stellarvue's new Flagship 152 mm f-7.9 Apochromatic Triplet Refractor. The high Strehl FPL-53 Ohara triplet has a conventional front element, FPL-53 center element and Lanthanum rear element for extremely sharp and high contrast performance. The aluminum tube is power-coated in our Instrument White color and the dew shield has the Stellarvue logo engraved on it. These are not mass produced optics. The SVX152T objective is hand figured in our optical shop in Auburn California to the highest optical specifications. We address spherical issues, astigmatism, trefoil and coma by individually hand crafting each objective by machine and by hand. We provide a certified test report with every 130 mm telescope we manufacture demonstrating its optical prowess. This lens, with its optical design and high optical accuracy outperforms less expensive lenses of standard commercial quality. 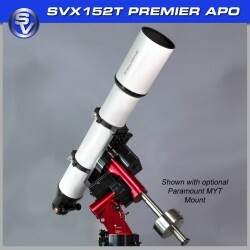 This is our highest resolution telescope which performs flawlessly as a visual or photographic instrument. There is a large photographic field flattener and a large reducer flattener available allowing for astro-photography at f-7.9 or f-5.6. With an APS-c or smaller chip, the telescope may be used without any flattener. Our massive 3.5" focuser has 3 7/8" of travel and holds even the largest/heaviest accessories without strain. The smooth 10-1 fine focus knob allows very focusing and may be outfitted with temperature compensating motorization. Each lens is tested here to meet our APO Triplet standard with straight lines, .96 or better Strehl ratio and an excellent Airy disk. Using the best glass combined with highly accurate figuring and continuous testing throughout the process, this is as good as it gets. For those currently on the wait list we plan to complete your telescope this year. Updates will be sent out every couple of months. New orders placed now should be delivered early next year. Your lens will be meticulously and individually hand figured here in Auburn CA to the highest optical standard. Performance of your lens will be documented here using our Zygo laser interferometer. This test report will certify the actual performance of your lens. The delivery date estimate shown refers to new orders placed now. Actual delivery dates may vary since each telescope objective takes a different amount of time to hand figure to perfection. The sooner you order, the sooner you will have yours.